Set in the 1930?s, Bobby (Jesse Eisenberg) is the nephew of one of Hollywood?s most important talent agents, Phil (Steve Carell). After moving to Hollywood, Bobby falls in love with his uncle?s secretary Vonnie (Kristen Stewart) but, devastated after their break-up, he realizes that Hollywood is not the right place for him and returns to New York. Here, he starts enjoying the nightlife at Café Society, a famous nightclub, where he meets the beautiful, divorced Veronica (Blake Lively). 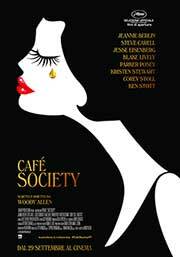 Presented as opening movie of the 2016 Cannes Film Festival, Café Society has all the peculiarities and features of Woody Allen?s way of making cinema (in spite of being the first digital film he has directed). Glamorous and brilliant, the film shines with a nostalgic glow which will bring the audience right back into the 1930?s. Well-written characters and beautiful photography contribute to the representation of a glossy world: the meta-language of cinema within cinema plays with the ongoing opposition between the durable and ephemeral, love and crime, Vonnie and Veronica, Hollywood and New York. A wonderful tribute to the seventh art. TRIVIA: Jesse Eisenberg acted in another Woody Allen?s film. Which one?